It's never too early to get started on learning your ABCs!!! Check out our blog topic Early Childhood Development benefits of playing with blocks. This was given to us by our local Head Start program to show us what our donated (oopsie) blocks would be used for. Very cool info. 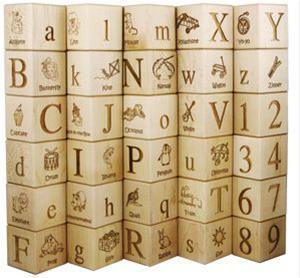 Each block is laser engraved on 4 sides (Capital Letter, corresponding animal, lower case letter, and corresponding item.